With holiday parties looming on the horizon, I had to put the nose to the grindstone to get something made because who really wants to wear last years outfit? I’ve had a piece of brocade in my stash for the last year and a half, purchased on a quick visit to Textile Fabrics in Nashville. I’ve been there twice now, both were quick visits in a store that entices you to stay and explore every nook and cranny all while eaves dropping on the dressmakers and stylists planning someone’s latest pageant dress or outfit for a concert performance. 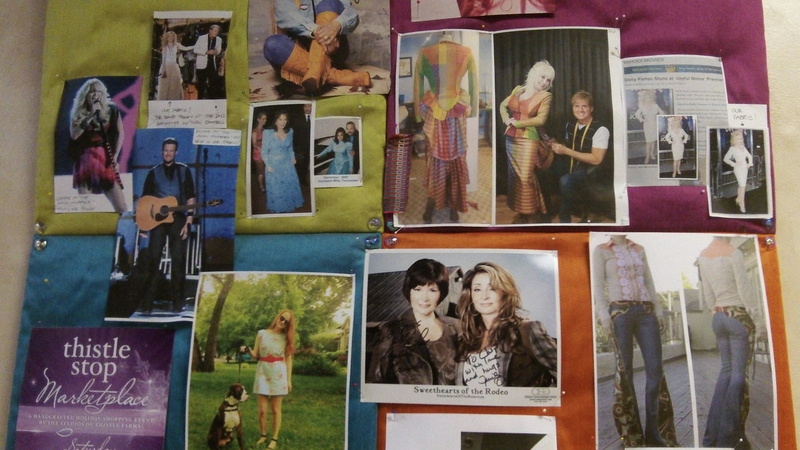 I don’t know much about country musicians, but even I recognize some of the photos on their board. The Nashville brocade does not have a traditional pattern and looks more like an abstract painting. The colors are vibrant and beautiful and although it would have made a great dress, a simple skirt would show off the fabric, but could go with a more casual look. Since I was pressed for time, the skirt pattern had to be one I made before (no muslin needed), Butterick 5466, no waistband with petersham ribbon instead of facings. 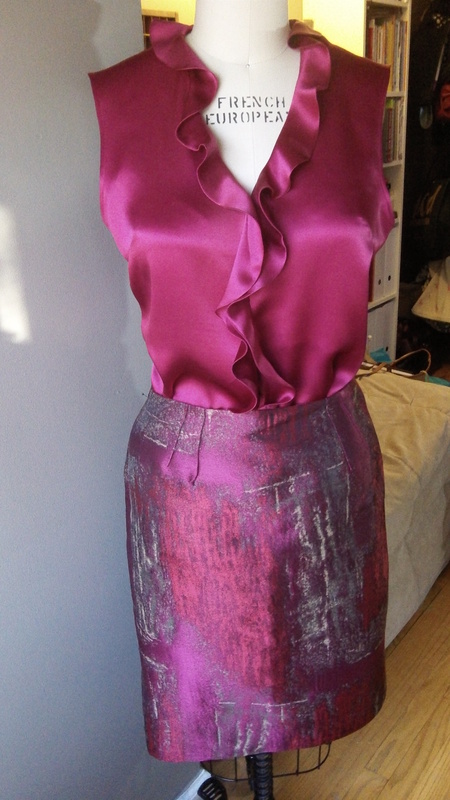 Doing a basic pencil skirt allowed me to it complete it in 2 evenings after work on a Monday and Tuesday. 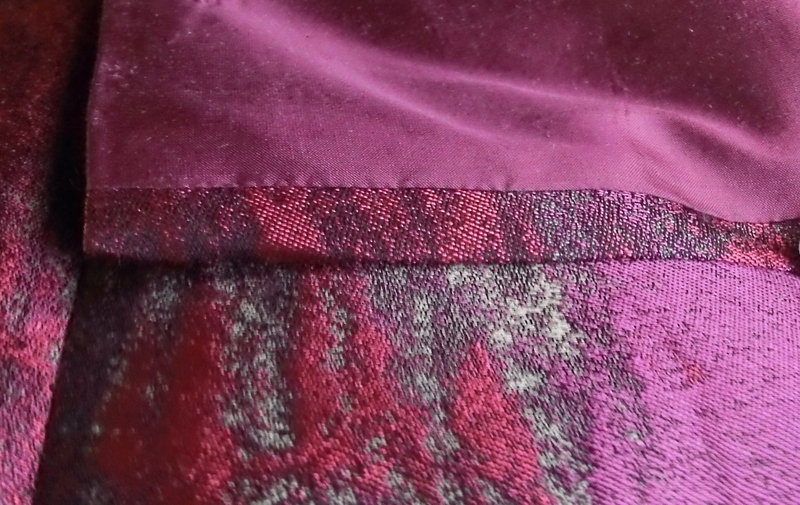 The lining was something I had in my stash and the perfect weight for the brocade. I bagged the lining, which is something I have never done on a skirt, but it gives it a nice finish at the vent. Bottom half done and 2 more evenings to work on the top half before the first holiday party. I don’t make many tops or blouses, not really sure why, but I checked the pattern stash and found Burda 8806, with a cute neck ruffle. 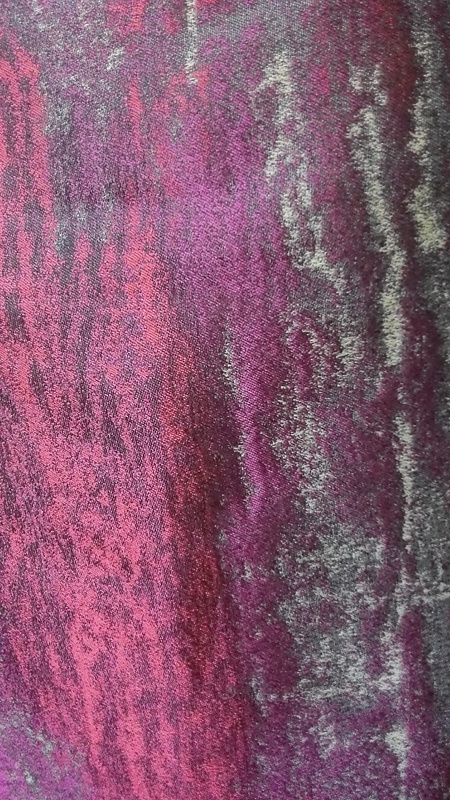 A few weeks ago, I was on a mission for Little French Jacket silk lining in Haberman Fabrics. They had a display rack of run-your-fingers-though-it silk pieces which may have been manufacturer bolt ends. 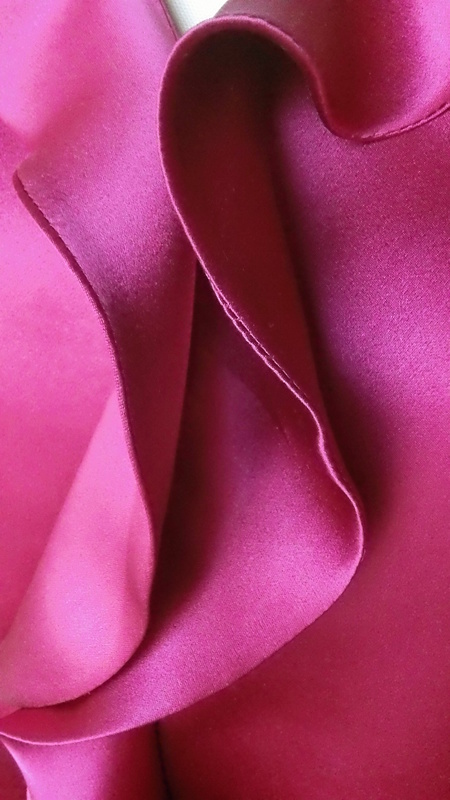 Along with the lining for my jacket I picked up an irresistible piece of magenta silk charmeuse. I bought it with the idea of making some sort of top or blouse, it was serendipity that it perfectly matched the brocade and there was just enough to do the sleeveless version of the Burda blouse. I did make a muslin before cutting into such a pretty fabric since there was no possible repurchase. My regular alterations to reduce the length at the shoulders and waist were all that it needed for a size 10. The recommendation on the pattern was for a fabric which is the same on both sides. Since the charmeuse has a shiny side and flat side, I cut two of each of the ruffles and sewed them together, so the shiny side shows on both sides. I was a little worried it would not hang as well, but the spiral ruffle gave it just the right drape. I also skipped the ruffle on the bottom as I planned to wear it tucked in and did not want any bulk at the hips. Again, this was a simple pattern and only took two evenings after work, Wednesday and Thursday. I actually finished on Thursday night, or at least I thought I had. The blouse closes with hook and eyes, the one thing I would change if I make it again. It called for 4 sets, but I used 6 to avoid any gaping at the bust. Trying it on one last time I realized 4 of the hooks were on backwards, that’s what I get for rushing. I fixed it on Friday at work (during lunch, can’t get away with sewing while working) and the outfit was ready to wear Friday night for my husband’s company party. Since it was a to be a casual party, I dressed it down a little with a sweater and boots. The skirt may only get a couple more wearings during the party season, but the blouse is looking forwarded to a long and versatile life. Thanks, I can’t wait to wear it again.